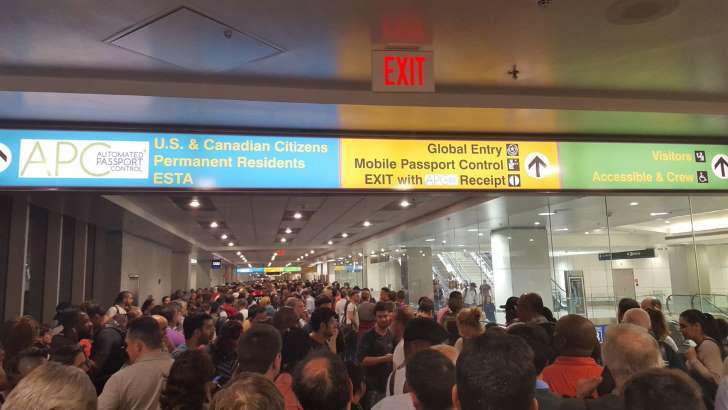 A nationwide outage for Customs and Border Protection has left throngs of people dealing with significant delays in South Florida, Atlanta and Boston, multiple airports reported Monday evening. Travelers took to social media to post photos and videos of the long lines and irritated customers. An official for Miami International Airport told NBC 6 that passengers on more than 30 international flights were affected by the outage. One traveler told the affiliate that two people had passed out while waiting in line. The list of airports that are reporting issues include: Miami International, Ft. Lauderdale/Hollywood International Airport, Hartsfield-Jackson Atlanta International Airport and Boston's Logan International Airport. Major chaos erupted at airports nationwide after a customs computer outage on Monday night that left thousands of travelers stranded for hours. Frustrated passengers waited in long lines from coast to coast just to be screened. Authorities are now looking into what caused the system-wide shut down. NBC’s Kerry Sanders reports for TODAY from Miami International Airport. The US Customs and Border Protection processing systems were back online at all airports later in the night, spokesman Daniel Hetlage said -- but not before creating long lines of disgruntled holiday travelers. CBP officers processed international travelers through "alternative procedures" while the agency scrambled to get systems back online. "During the technology disruption, CBP had access to national security-related databases and all travelers were screened according to security standards," Hetlage said. "At this time, there is no indication the service disruption was malicious in nature." 0 Response to "Nationwide customs and border outage fuels travel delays"